Sobharam Basak was the founder of Jagannath Ghat. It is said that Sobharam settled in Barabazaar when the new Fort William was being constructed. Therefore, Sobharam must have founded Jagannath Ghat sometime between 1758, when the rebuilding of the Fort started, and 1773 – the year Sobharam died. In all probability, Jagannath Ghat’s foundation should be around 1760s. Sobharam built the Ghat by the side of the Jagannath Temple he had built at 1, Nabab Lane. The Ghat was initially known as Sobharam Basak’s Bathing Ghat, known from the List of Old Ghats published in 1789. See: Harisadhan Mukhopadhyay. 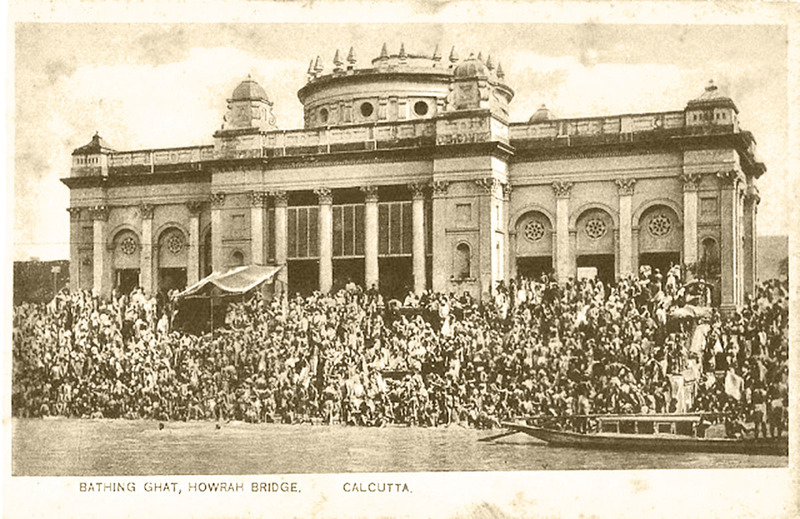 Shortly after, the name changed into ‘Jagannath Ghat’ as revealed in old accounts and maps of Hooghly River. The name Jagannath Ghat continued to be in vogue for two and half a century until 2012, when it was miraculously replaced overnight by an unfamiliar name of Chotulal’s Ghat. All this happened subsequent to the recent discovery of a treasure-trove in shoe-box containing 178 photographic imagery of Colonial India. 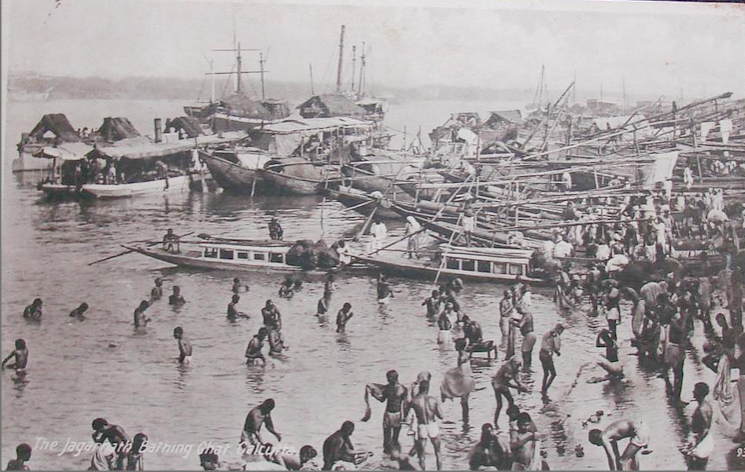 The shoe-box included two photo prints of the particular bathing ghat. 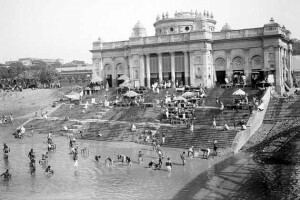 Both the prints bear a short unsigned note: “Chotulal’s Ghat, Kolkata. 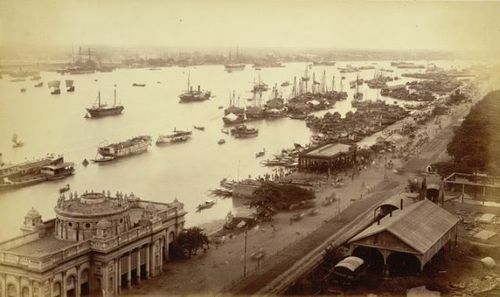 Photograph probably taken from the old Howrah Bridge, 1912-1914”. The photographs were taken by Johnston & Hoffman in 1885. It is unimaginable how the learned people and institutions could accept unquestioningly a new name tipped off by an unidentified writer, rejecting a well-established name unceremoniously. Today, even the old photographs of the edifice of Jagannath Ghat are being referred to as ‘Chotulal’s Ghat’ – a name that never turns out in historical accounts or maps. But who this Chotulal was? So far we gather, there was no Chotulal, or Chote Lal in Calcutta who might have owned the bathing ghat. Bathing ghats are generally named after a deity or a celebrity who made it for public benefit. Chotulal of Calcutta might have been not a celebrity, but a commoner like Chand Pal, the owner of small shop at the river ghat later named Chandpal Ghat after him. It was not improbable that Chotu Lal happened to be a member of a particular Chiranji Lal – Sham Lal’s family and had a leading role in running their family business of Steamer Cargo Service from Jagannath Ghat steamer station. Jagannath Ghat, from where Chotulal might have conducted his business, possibly in due course earned a nickname Chotulal’s Ghat. This conjecture about Chotulal, right or wrong, has partial documentary support, which shows that there was actually an active marine dispatch service station at Jagannath Ghat, managed by some Lals. 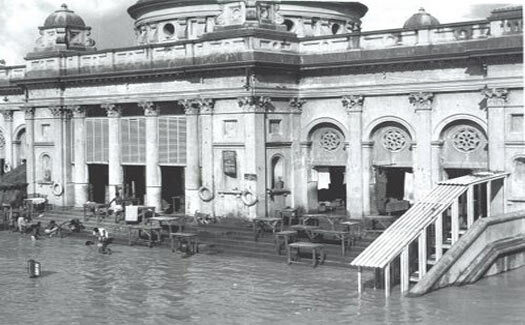 A busy bathing ghat apart, Jagannath Ghat was one of the busiest steam navigation stations on Hooghly serving many of the public and private Liner Services appeared in the published listings, rearranged in late 1841. Between Calcutta and Allahabad, intermediate ports were then Rajmahal, Bhagalpore, Munghyr, Dinapore, Ghajipore, Benares, and Mirzapore, carrying both freight and passengers. By 1852 there was also a Dacca and Assam Line. Similarly, there were liner services with Chittagong, Arracan and Moulmein in Burma. Burma commercial operators, such as the Calcutta and Burmah Steam Navigation Company became the British India Steam Navigation Company. 1875 onward, India Steam Navigation Company introduced some of their long distance Liner Services between London-Cal (1875), Calcutta-Australia (1880), and Calcutta- New Zealand (1896). Alfred Hugh, a travelling artist, told us about the memorial tablet he noticed on the stone-wall of Jagannath Ghat. The Tablet revealed that from Jagannath Ghat steamers took pilgrims to far-off places. The ghat was standing in the mid-1940s but that has since been lost. The last photograph, I guess, was perhaps the one taken in 1844 by Glenn S. Hensley. The edifice was then in good shape. Now it is turned into an unsightly place overshadowed by desolate warehouses of River Steam Navigation Company and Indian General River Navigation Cooperation of the then Inchcape Group. 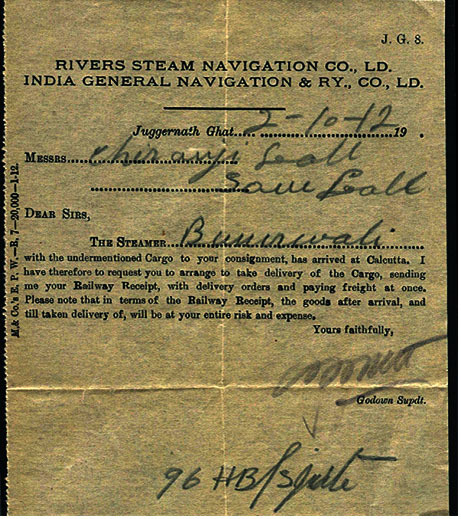 This entry was posted in Bathing Ghats, Ferry Ghats/ Harbors, River Banks, Water Transports and tagged alfred hugh, allahabad, arracan, barabazaar, benares, bhagalpore, british india steam navigation company, burma, burmah steam navigation company, calcutta- new zealand, calcutta-australia, chiranji lal, chote lal, chotulal’s ghat, dacca-assam line chittagong, dinapore, ghajipore, glenn s. hensley. river steam navigation company, harisadhan mukhopadhyay, inchcape group., india steam navigation company, indian general river navigation cooperation, jagannath ghat, jagannath temple, johnston & hoffman, list of old ghats, london-calcutta, mahendranath dutta, mirzapore, moulmein, munghyr, nabab lane, north calcutta, rajmahal, River Hooghly, sham lal, shimulia, sobharam basak, steam navigation station, steamships. I have gone through the blog of Animesh Babu commented here and found the information on Chottelal ghat. Many new information on making of this ghat, you can have a look. It is indeed very kind of you, Indrani, to draw my attention to Animesh babu’s excellent article, Reaching Chottelal Durga Prosad Ghat at Kolkata. This is the first time we know who Chottelal was and how he was related to the controversial ghat. I would surely go through the details as soon as I get time and give my personal comments with sincere thanks. Thanks for your reply. You have posted two link of google map which is showing picture, one set of picture is of Juggernath Ghat another is Chottelal Ghat. Actually picture is uploaded in the Google map by the Local Guide. Person who have uploaded the picture of Chottelal Ghat in the place of Juggernath Ghat is erroneous. However, black and white picture of Chottelal Ghat is taken by Glenn S. Hensley in 1944, a american shoulder came in Kolkata during World War II. There should not be any confusion if your visit two Ghat, one is next to Flower Market, south of Howrah Bridge and another is Juggernath Ghat, north of Howrah Bridge, just beside of ‘A’ Shed. I will wish to post on article on Chottelal ghat in my blog http://ekolkata.blogspot.in soon. The name of Juggernath Ghat was naver replaced by the name Chottelal Ghat. Two ghat exists either side of Howrah Bridge. Juggernath Ghat is situated at the Northern side of Howrah Bridge and Chottelal Ghat is on the Southern side of Howrah Bridge beside flower market. Both are different ghat, and you have posted the pics of Chottelal Ghat as Juggernath Ghat. Please pay a site visit and explore these two site. I thank you once again for your effort in clearing anomalies for identifying the two old ghats. The most significant clues you have provided are (1) approximate date of construction, (2) Name of the Builder, and (3) the spelling of the Ghat’s name as ‘Chotte Lal Ghat’. We may use these gainfully depending on the reliability of the source, which I expect to know from you soon. I do hope it is some authentic document possibly issued by the Port Commissioners, and not like a Google map. The objective of Google Map is very different, and not at all any good to serve historical interest. By following your links I found quite a few ghat photographs in Google map, which tend to confuse our mind further. Firstly I would like to thank you for sharing these stories. I have sent you an email at asoknath.m@gmail.com regarding some facts which I would like to verify with you. Please revert whenever you have time. In case you have not received my email please let me know. I am now seeking data for the reconstruction of the deck furniture cabins etc., for a fully rigged and detailed, waterline model in 96th scale. The ship at this time is far removed from it’s original configuration, having been converted into an oil tanker in the 1940s. I do have a copy of the original board room painting of the ship, see attached, together with a deck layout of the ‘Falls of Garry’ (1886) from ‘Last of the Windjammers’ Vol-1. The layout on both looks to be almost identical, as would be expected, having been built for the same Owners, by the same Builders, (Russell & Co, Port Glasgow) for the same Trade. Also built by Russell, between these two ships were the ‘Falls of Bruar’ – 1879, ‘Falls of Afton’ – 1882, ‘Falls of Dee’ – 1882, ‘Falls of Foyers’ – 1883, & ‘Falls of Earn’ – 1884. My search is for deck layouts, plans, and photos of anything taken on the decks of any of these ships, as all can indicate something of the possible original design and look of cabin structure and deck furniture pertaining to the ‘Falls of Clyde’. Some times crew members would have their photos taken on the ships, and the background information shown in these can include a wealth of ship detail. Should you hold deck plans and or detail photo of any of these ‘Falls Line’ 4 masted ships, I would be most grateful to have details of what is available. The completed models, have not been commission by, but will de donated to ‘The Clyde Maritime Trust’ for display on the ‘Glenlee’ or the ‘Falls of Clyde’ if she can be got back to the Clyde for restoration.